With a change in the weather, it feels like summer has finally arrived in London. Time to revisit Kew Gardens, the mother of all botanical gardens. 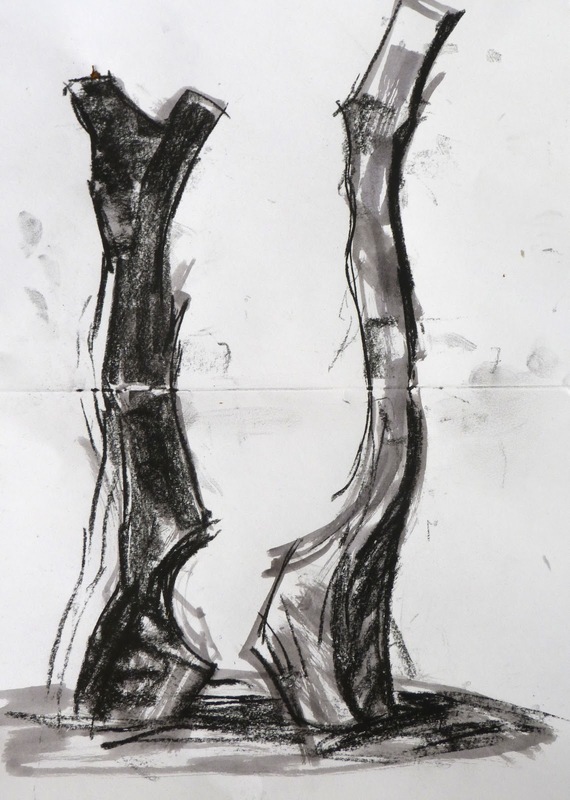 Kew is especially good to visit this summer because of the exhibition of work by sculptor David Nash which is spread through the gardens, but also has a stunning indoor exhibition (in case of showers). Karin Murray and I spent a day drawing some of Nash's great black bronze pieces - they're cast from, and look like charred wood. I absolutely love them. If you're in London and want to avoid Olympic frenzy, try visiting Kew! 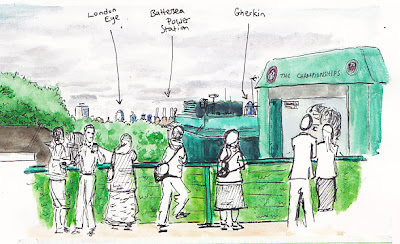 Urban Sketchers London's first exhibition has opened at The Gallery at Foyles, Third Floor, 113-119 Charing Cross Road. Page spreads from The Art of Urban Sketching also feature on the walls of the Gallery and the exhibition is called The Art of Urban Sketching. 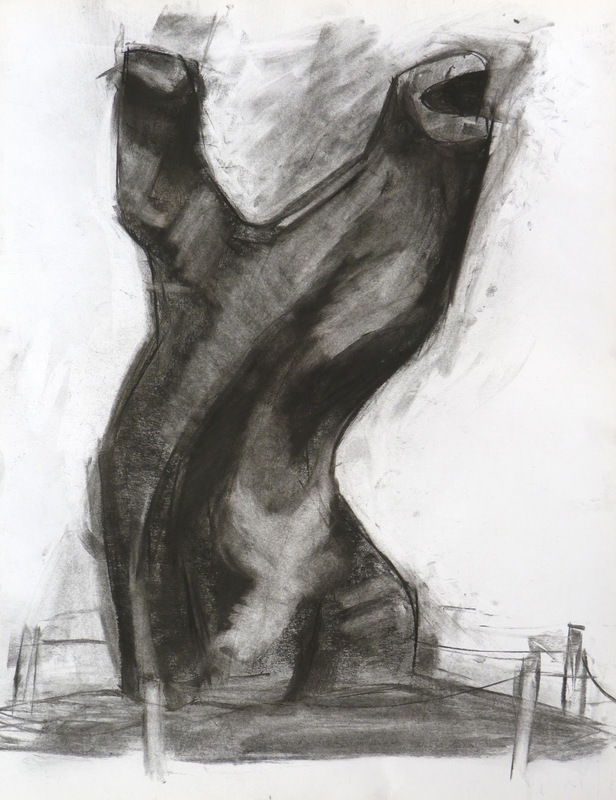 This week, for those of you are unable to visit we'll be giving you a virtual preview of the exhibition. Below is an extract from the catalogue for the exhibition. 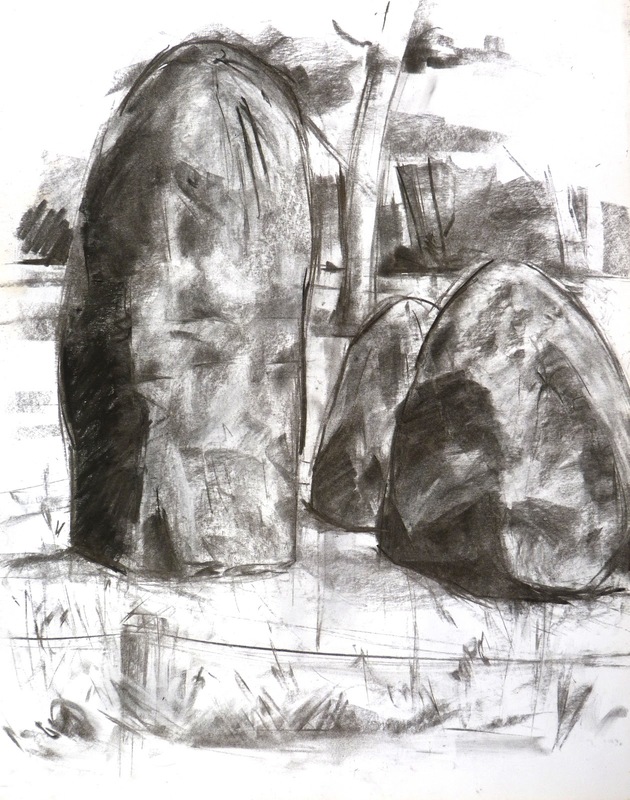 Every day this week we'll also be featuring the correspondents and their artwork in the exhibition. You can, of course, only get a really good look if you come to the exhibition! Plus Foyles also have a very good section about Art on the second floor of the bookshop! You might have seen them at the coffee shop, on the tube or in the park. Pen and paper in hand, or maybe wielding a waterbrush and small palette, they are sketching – drawing and painting the world around them; documenting both the magical and the mundane aspects of the city. Their open sketchbooks show lively streetscapes, soaring architecture, green spaces and intriguing faces – all quickly rendered on the spot – sometimes furtively, sometimes in front of a gathering crowd. 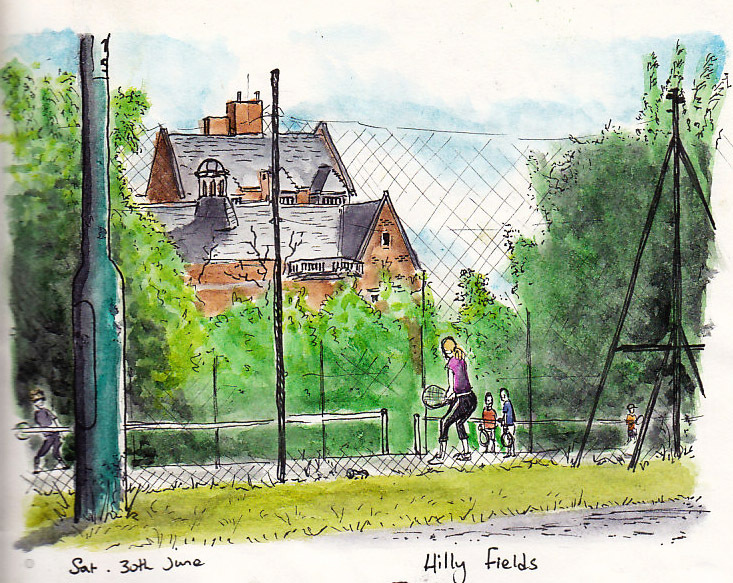 In watercolour, ink, graphite or coloured pencils, urban sketchers draw scenes from their daily lives in cities around the world. Urban Sketchers began as a Flickr group in 2007 and has since grown to become a website showcasing contributions from correspondents across the globe. A network of regional and countrywide groups of urban sketchers local to an area has also developed – and Urban Sketchers London is one of these. Our mission is to "Show the World, One Drawing at a Time". The Art of Urban Sketching – now available to purchase in Foyles – is the first collection of images, advice and inspiration from this growing community. The book is already on its third reprint. The first and second print runs sold out within the first three months following publication in the USA earlier this year and has been eagerly snapped up by sketching fans around the world. 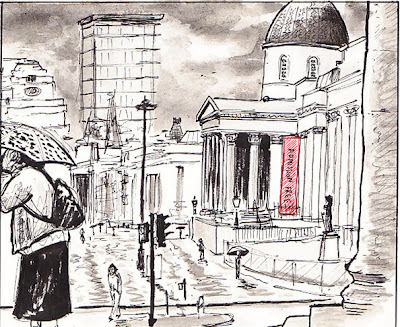 Have you bought a copy of The Art of Urban Sketching by Gabriel Campanario yet? 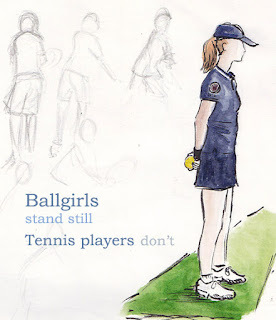 Urban Sketchers London are delighted to be publicising this very popular book and exhibiting their work by participating in Foyles Bookshop's Sketching the City summer season of exhibitions about sketching. 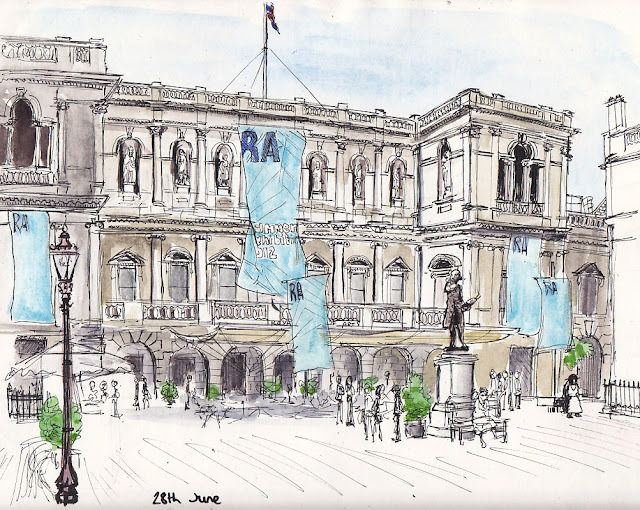 Works by London-based urban sketchers that are included in The Art of Urban Sketching will be on display at the third-floor gallery in Foyles flagship bookshop at 113-119 Charing Cross Road, London from next Monday. plus other framed works by London-based Nathan Brenville, James Hobbs, Barry Jackson, Olha Pryymak, Katherine Tyrrell and Zhenia Vasiliev. The Art of Urban Sketching Exhibition is for one week from Monday 16 July to Sunday 22 July 2012. 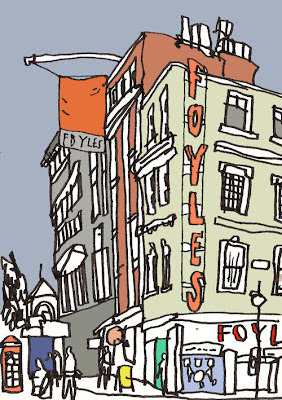 For more details about the gallery's opening hours and how to get to Foyles, check its website. The book is on sale in the shop and at the exhibition. 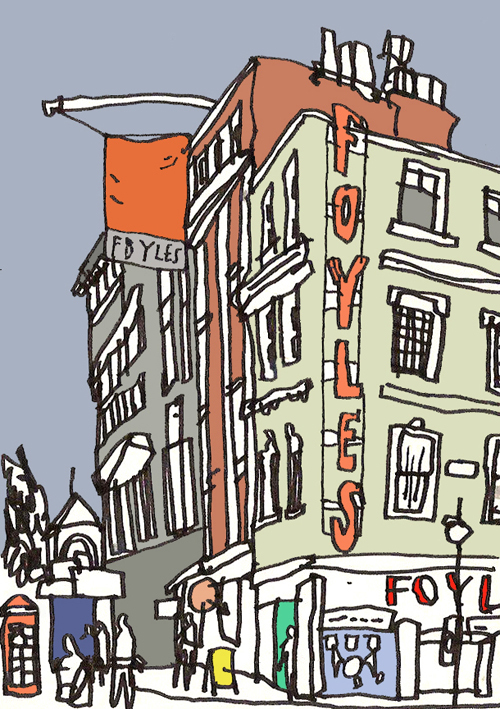 Further details about the events in Foyles Sketching in the City season, which continues until 26 August. Every year for a few brief weeks, tennis fever grips the nation as we proudly watch our British players try and inevitably fail to get to the final of Wimbledon. But whaddya know - THIS YEAR HE'S GONE AND DONE IT!!! Andy Murray is through to the final, and win or lose, he's achieved something special. As a true part-time tennis fan, I've picked up a racquet myself and gone out on my local courts, trying to emulate our British number one. My closest place to play is Hilly Fields, which is also a great place to sketch, there are some fantastic panoramas of surrounding London and Kent, and I'll be returning there soon when there's some good weather for more drawing. I like the building in the background, which is actually a college. I used to play tennis regularly, but its been a couple of years now since my last game. Living in London though, you can't beat the real thing, and Wimbledon is only 40 minutes away from me by tube/train. On Wednesday I went down there to try and see some of the men's quarter finals. I got to see Roger Federer warming up on an outside court, but the real attraction was Andy Murray's match. To get in to Centre Court, unless you've booked way in advance, then you need to queue up for resales. Anyone who leaves early hands in their ticket, and they're then resold cheaply, with profits going to charity. We arrived at 10am, and were queuing all day. 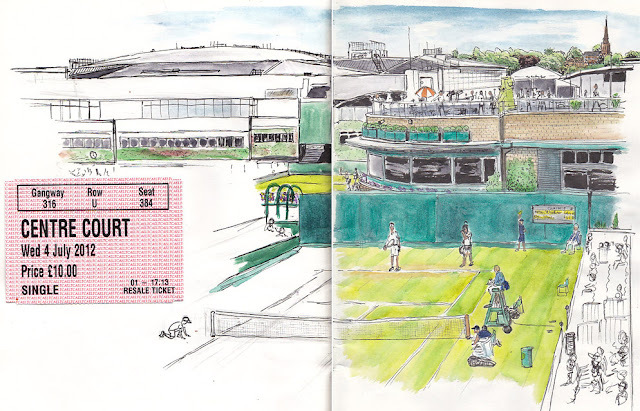 It was such a long wait that I felt I could attempt an ambitious drawing- the view from just above 'Henman Hill', of Centre Court and surrounding courts, with Wimbledon town in the background. I had a good feeling about this sketch, but unfortunately I didn't reckon on a) frequent bouts of pouring rain and b) I wasn't supposed to leave the resale queue for longer than 15 minutes at a time, so I didn't get to finish, which I was annoyed about. But finally, at 5pm, we got tickets in time for the end of the 2nd set of Murray's quarter final, right at the turning point of the match. The atmosphere was electric, unlike anything I've been to before. It was a very tense match, and it was hard to concentrate on drawing when the game was so absorbing, but I managed pretty well, doing the majority in between points and during a rain break. I finished the colour off at home. 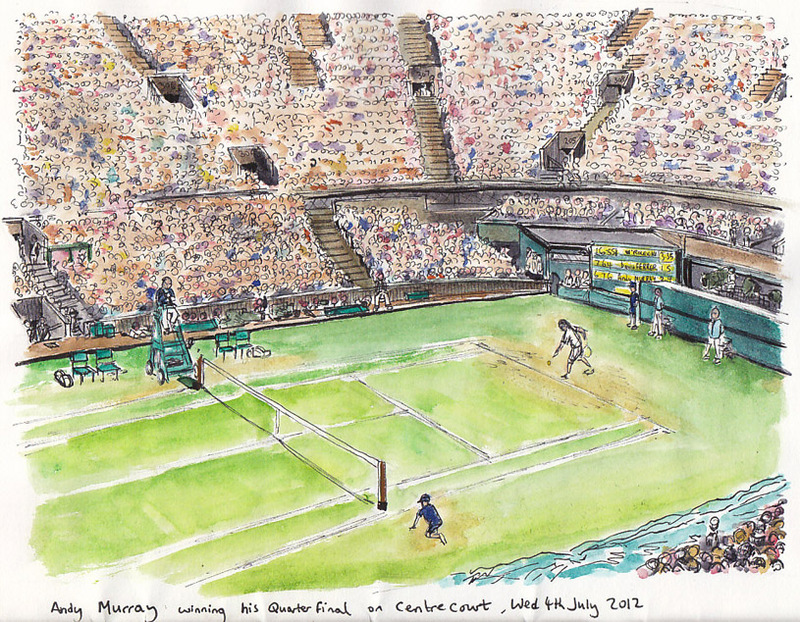 This was my third time visiting Wimbledon, but the first on Centre Court, and it was definitely worth the queuing. 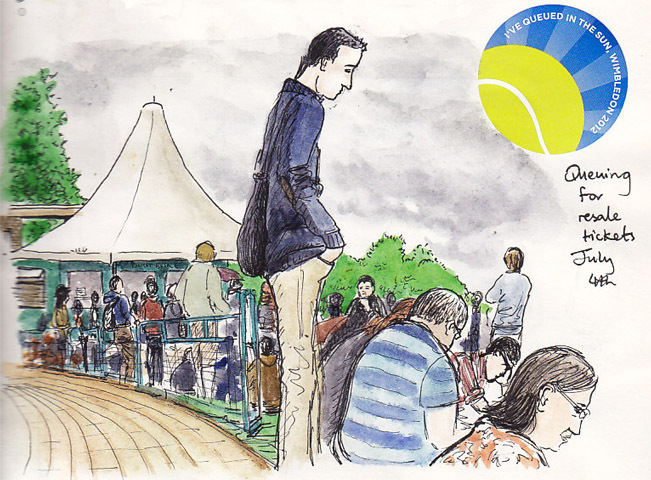 I may even go back down on Sunday just to sit on Henman Hill and watch the final, but I'm not sure I'll have the steadiness of nerves for more drawing - I'll be too busy shouting "Come on Andy!" I'm fascinated by the illustrious history of the Royal Academy of Art, and seeing exhibitions there is always a pleasure. I've been wanting to draw the outside of the building for a while now, so last week I made time to stop by and sketch it on a fiercely sunny day. The Summer Exhibition is on at the moment, and the choices for display are always interesting, and often provokes debate about what should and shouldn't be called contemporary art. Don't get me started on that subject! But the story of one year when the RA rejected a sculpture but accepted and displayed the plinth it came with, believing it to be a separate work of art always makes me chuckle. The Summer Exhibition has been held every year since 1769, the year after they were founded. The Royal Academy weren't always at Burlington House however. For a number of years they were based in Somerset House, where the Courtauld Institute is now housed. Eventually, they moved to share lodgings with another great London art institution, in the newly built National Gallery, in 1837, and then, as both continued to expand, moved to the present site 30 years after this. This last sketch was done while it was raining and quickly became the most uncomfortable location drawing I've done - I thought I'd found a sheltered spot on the steps of St Martins In the Fields, but as it rained harder my sketchbook was getting soaked, and I was desperately trying to finish as quickly as possible, one hand drawing, one hand holding the book, another hand balancing a broken umbrella...wait, I didn't have that many hands... which is probably why I got very wet, and cramp. I gave up and did the ink wash at home.